In the 1970s unexpected forest damages, called “new type of forest damage” or “forest decline”, were observed in Germany and other European countries. The Federal Republic of Germany and the German Federal States implemented a forest monitoring system in the early 1980s, in order to monitor and assess the forest condition. Due to the growing public awareness of possible adverse effects of air pollution on forests, in 1985 the ICP Forests was launched under the convention on long-range transboundary air pollution (CLRTAP) of the United Nations Economic Commission for Europe (UN-ECE). The German experience in forest monitoring was a base for the implementation of the European monitoring system. 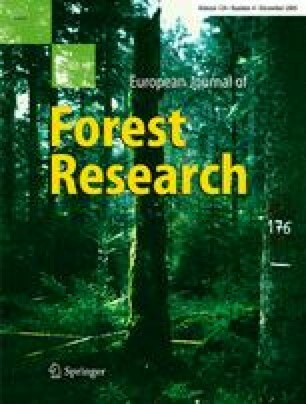 In 2001 the interdisciplinary case study “concept and feasibility study for the integrated evaluation of environmental monitoring data in forests”, funded by the German Federal Ministry of Education and Research, concentrated on in-depths evaluations of the German data of forest monitoring. The objectives of the study were: (a) a reliable assessment of the vitality and functioning of forest ecosystems, (b) the identification and quantification of factors influencing forest vitality, and (c) the clarification of cause-effect-relationships leading to leaf/needle loss. For these purposes additional data from external sources were acquired: climate and deposition, for selected level I plots tree growth data, as well as data on groundwater quality. The results show that in particular time series analysis (crown condition, tree growth, and tree ring analysis), in combination with climate and deposition are valuable and informative, as well as integrated evaluation of soil, tree nutrition and crown condition data. Methods to combine information from the extensive and the intensive monitoring, and to transfer process information to the large scale should be elaborated in future. The study was conducted within the framework of the combined project “Concept and Feasibility study for the Integrated Evaluation of Environmental Monitoring data in Forests” (No. 0339985), founded by the German Ministry for Research and Education. We would like to thank for this financial support. Especially thanks to Dr. R. Loskill, Ms. H. Neumann, and Ms. P. Mahlitz. Associated projects were founded by the Federal Agency for Agriculture and Food (No. 01HS002 and 00HS041), we would like to thank Ms. U. Neumann. We would like to thank Mr. Th. Haußmann, German Ministry for Consumer Protection, for all kind of support in all stages of the project. Participating institutions in the IFOM project are (a) the federal research centre for forestry and forest products (BFH), (b) forest research institutions of the German federal states, as well as (c) university institutes, and (d) the German environmental agency. In the sub projects various forestry disciplines closely cooperated. In Fig. 2 the sub projects (SP) and their position in the whole project are presented. The evaluations can be divided into the fields “cause-effect-relations” and “regionalization”, but there are many transitions and overlapping tasks. All sub projects are assigned to at least one thematically item. The coordinating institution is the Institute for Forest Ecology and Forest Inventory of the Federal Research Centre for Forestry and Forest Products, located in Eberswalde. The task of the project coordination (SP 1) is the acquiring, documentation and distribution of external data, the organisation of status seminars and reporting. Together with the other project partners, the synthesis of the results, and the formulation of the recommendations is the final task of SP 1. In the project “data management” (SP 2) a unified data management system for the storage of all environmental monitoring data was developed, including the implementation of algorithms for frequently occuring evaluations. The permanent cooperation with forest scientists from the other projects is essential for this. In SP 3b the suitability of the inclusion of growth data in the large scale monitoring (level I) was tested. The subject of the associated project 6b, funded by the “Federal Agency for Agriculture and Food”, was the simulation of growth and vitality. Using the model BALANCE growth and vitality of single trees of different level II plots were calculated on the base of physiological processes. The evaluation of nutritional development types was in the focus of the SP 7b, with the aim to bridge gaps in time series and to transfer the results to the large scale. The special focus of SP 4 was the test of various geostatistic and multivariate methods for the regionalization of environmental data. The—in some aspects—more dense monitoring net in Baden-Wuerttemberg, compared to entire Germany, provides the opportunity for this. The associated project “Integrated evaluation of forest monitoring data with multivariate methods” (financed by the “Federal Agency for Agriculture and Food”) deals also with the calculation of regionalization basing on the forest condition types or deposition. In SP 5 data from the level II monitoring were screened and evaluated in order to elaborate a strategy for integrated evaluation based on potential stress for forest trees.